255 W. Napa St. Unit F FIRST MONTHS RENT FREE. 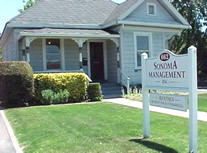 Sonoma Management Inc, is located at 662 Broadway in a historical Sonoma house built over 100 years ago. We are a fully licensed, insured and bonded property management company, including a full, in-office support staff who are ready to assist with your rental or property management needs. Need Help Renting-Out Your Home? Founded in 1982, Sonoma Management is the largest, full-service property management company in Sonoma Valley, specializing in residential, duplexes, condominiums and apartments. Our goal is to produce optimal revenue for property owners while maximizing and enhancing the value of their real estate... Find out more! Have you been looking to relocate to the lovely Sonoma Valley? Currently living here and just ready for a new place? With the largest and most diverse list of rentals in the valley, Sonoma Management is the company to help you with all of your relocation needs! Click here to view our current listings.